Say Happy Birthday at breakfast with Funfetti Waffles! Packed with sprinkles to give them a burst of color with every bite. They are cake-like in taste and texture, and perfect served with a scoop of ice cream on the top. This is a fun birthday breakfast idea that adults and kids will love. In a medium bowl, mix together the butter, eggs, sugar, milk, creme fraiche, and vanilla extract. Pour the wet mixture into the bowl with the dry mixture and stir together until incorporated. Do not over mix, and a few small lumps are fine. Pour or scoop the mixture into a hot waffle iron (I used a 1/4 cup measuring cup for each waffle, but waffle makers vary). Cook waffles for 3 1/2 - 4 minutes, until light brown and cooked through. Once done, transfer the waffles to a cooling rack. The waffles are very soft and light in color when they are done, but will quickly start to hold its shape once it starts to cool. Serve with a scoop of vanilla ice cream and sprinkles on top. 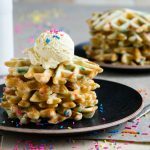 Get this recipe for Funfetti Waffles at https://www.theworktop.com/breakfast-brunch-recipes/funfetti-waffles/.